Wright Chat :: View topic - Neils House (Minneapolis, MN) is up for sale! Neils House (Minneapolis, MN) is up for sale! Posted: Thu Sep 13, 2007 11:37 am Post subject: Neils House (Minneapolis, MN) is up for sale! I can only imagine what it would be like to be here in the Twin Cities and having the means to be able to have to choose between purchasing the Neils House or the Lovness Estate. What's the Powerball jackpot up to now ? Easy choice for me I'd take the Neils House. The realtor is a bit off though on the number of FLLW houses in Minnesota - without consulting my books I can think of seven houses. Thanks, Eric. Nice photos -- and a plan, literally unheard-of in real estate representation ! It looks like Mr Neils, a metal-window man among other things, may have convinced those working on the house (Wright, Peters [? ], Geiger, Oyakawa, and Besinger) that the glass couldn't or shouldn't be frameless at the ceiling plane -- as it is in the contemporaneous Sweeton and the slightly later Glore (at least) with their similar gable roofs and plastered ceilings. This is only my conjecture, of course; Besinger says nothing of the kind in his brief mention of Neils in his book, though he does touch on the difficulties of framing these open-ended gable roofs. . . Didn't notice that, I usually try not to read real estate agent narratives. But, you're absolutely right, there are more than 4. Willey, Neils, Olfelt, Lovness, Bulbulian, Keys, McBean, Elam & Lafond - maybe the realtor meant only 4 in the Minneapolis-St. Paul Metro Area? Notice in the third photo, there is a mullion at the intersection of the two walls of glass. Originally, according to early photos published in print ads for aluminum fenestration, that was mitred. Must have gotten cold. It's a beautiful house, and at that price, in that neighborhood, it might even sell for close to the asking price. Or that may be my Californianess speaking again. thirty varieties of marble appear in the walls of the house. I forgot about the house in St Joseph but have to admit I am not familiar with the Olfelt house. Anyone have any pictures they can share?? After seeing Mr. Hardings nice photos and the Neils shot, I find it interesting these designs have survived uplift and shear loads for so long without Simpson hurricane ties, hold downs and Strong-walls! The 3 adjacent hallways in plan is unusual for any architect let alone Frank Lloyd Wright. I can't imagine that was Mr. Wright's preferred circulation scheme on this project. It looks like something that came from the client. Also it appears that there is no true master bedroom that would handle today's queen size bed. I have admired the scale and sculptural quality of the Neils house, and as it is built right next to the road, it is easy to see. The daughter of the builder lives here at Battle Lake (in their Susanka house) and has provided some insight into the mitered glass corners. The many (eight?) glass corners caused the builder continued problems keeping them sealed, and eventually led to them being closed with metal strips. I wonder if insulating glass was also installed. The FLLW Monograph has the original scheme, which provides an answer to the odd three adjacent hallways. This original scheme was apparently conceived by apprentices. There was a typical long covered outdoor path to the front door, parallel to an indoor bedroom hallway. Wright made major alterations to the apprentice plan, truly changing it from a house to a work of art. In this process he moved the exterior wall out to enclose the outdoor path, and this may have been requested by the client, considering the possiblity of snow filling the area in winter. He then added a new outdoor path that serves as a service and maid's entrance. Three adjacent hallways, practical and beautiful. Where is the master bedroom? Only three tiny bedrooms. Again take a look at the Monograph's original scheme. Mr. and Mrs. Neils apparently requested separate bedrooms, joined without doors around a closet and bath module. In the redesign the bedrooms became smaller, as did the design unit, which was reduced from 48 inches to 42 inches. The reduced unit may have been to reduce costs, or to allow a better fit on a beautiful but small lakeshore building site. It is indeed interesting how these houses withstand wind loads. Their angular design shifting the loads to very strong masonry corners, and the "visual anchor" of the huge fireplace masses contribute greatly to their strength. Bolts anchored in the masonry held the roofs to walls, but I wonder how they fastened roofs to the window mullions. but I wonder how they fastened roofs to the window mullions. That is the most intriguing aspect to me. Anchorage is possible a number of ways in a mass, yet the connection of wall (windows basically with Frank!) to roof is most critical in any structure, and these thin roofs withstood storms and have held tons of snow over the years. 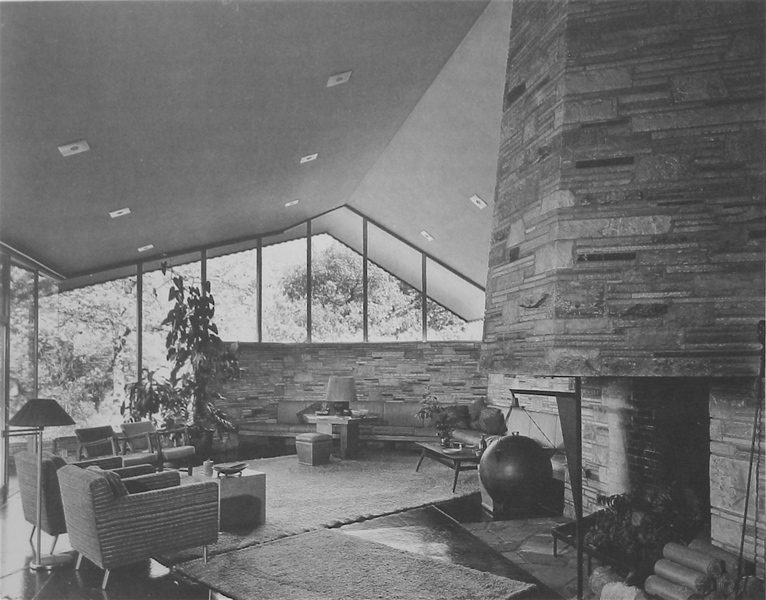 This was certainly addressed in the Grant house with its massive concrete roof-but again-those plate glass walls and almost imperceptible vertical structural elements.... all I can say is cantilever, cantilever, cantilever! Amazing, the amount of confidence he had-justified or not on occasion! It would be possible to include a threaded rod in any or all vertical members, even wood or aluminum mullions, if desired; I wonder if Wright and Co would have thought that was necessary. Uplift wasn't formerly considered and dealt with as it is today, no ? I believe that is true, at least to the degree engineering was considered in residential design at the time-of course the Fallingwater saga was a whole different situation! Interesting you mention the threaded rods, that is exactly how my house is in fact secured. It would be interesting to know if that was the case with these roofs, or perhaps thin but "adequate" steel elements. How the rods would be secured well enough to the foundation without todays epoxies might be an issue.